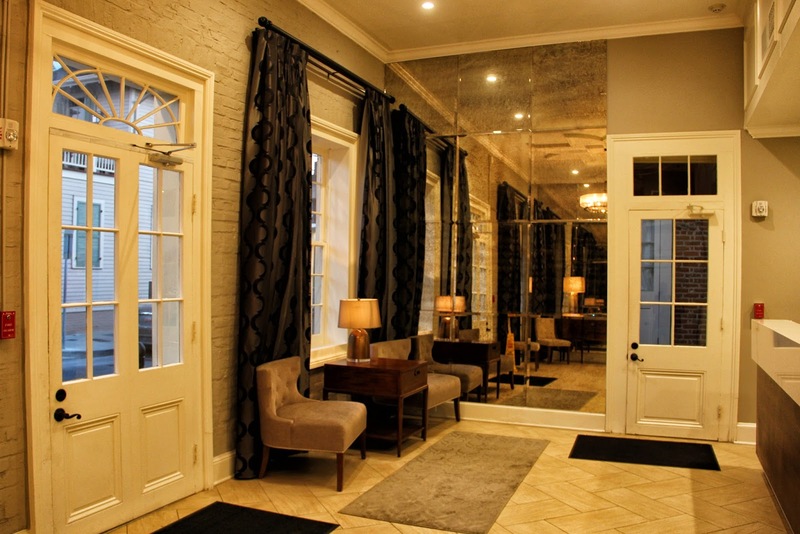 When I first entered Louisiana, a lady at the visitor center told me I wouldn't find a better rate than the 5 hotels she had on her list and the St. Pierre was the best one. 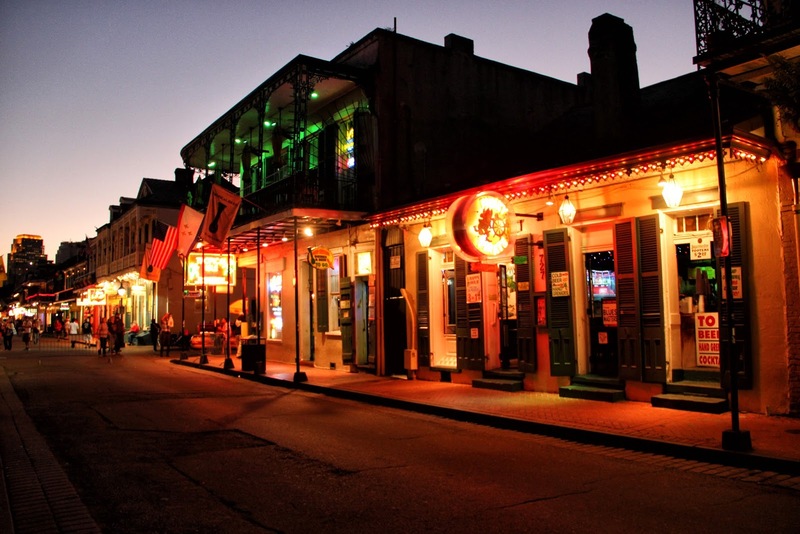 I headed towards New Orleans with the name and address on a piece of paper. 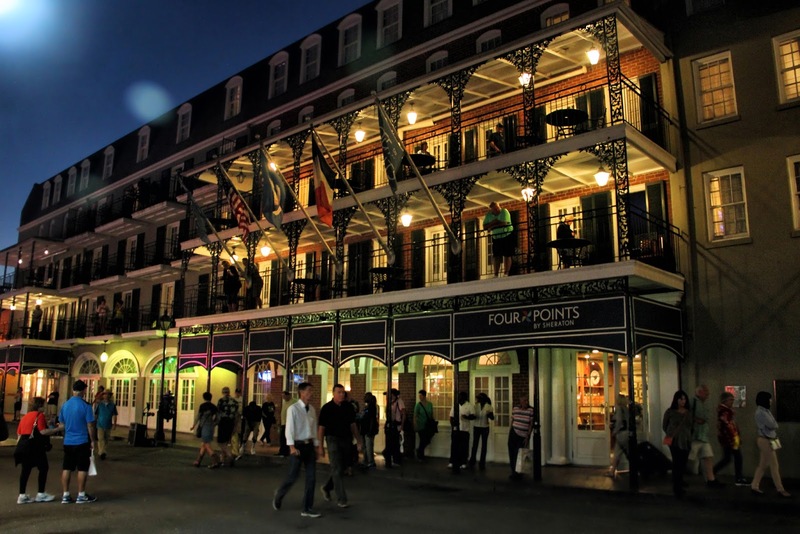 I take exit 235A on I-10 into New Orleans, make a left off the ramp and head straight to the French Quarter, having never been here I had no idea what to expect. I navigate the narrow roads, go past the Louis Armstrong Park, pick the first road that goes south and soon I was on Decatur Street. I look left then right and see a guy on a BMW GS dismounting. I head towards him, park my bike and while taking my helmet off I see him looking at my plate. He looks at me and says: you from NJ? I'm from Brooklyn, NY. What are the odds the first guy I meet lives close to me. I look across the street and I'm in front of Cafe Du Monde, which is packed with camera toting tourists. After a little chat he tells me he knows the area well, his girlfriends lives in New Orleans, points me in the right direction and off I go looking for the hotel St. Pierre. A few minutes later I'm stopped in front of the Hotel St. Pierre, just a plain house I assume, I'm not impressed. I head inside and my jaw almost dropped to the floor, to my surprise the inside is nothing like the outside, beautifully decorated and looks brand new. I later found out the outside of the houses can't be changed to keep the tradition. I ask the room price and my jaw drops again, twice what I had been told at the visitor center. The front desk clerk explains to me without proof from the visitor center there's nothing she can do. 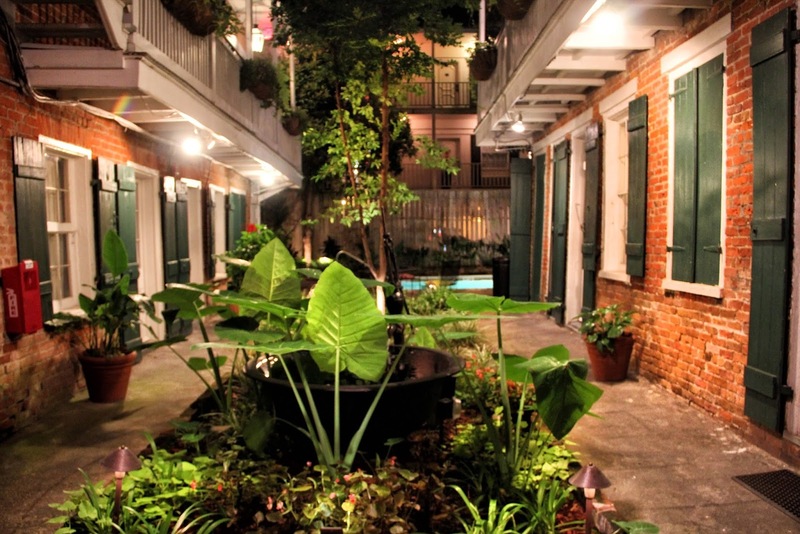 She also mentions that most motels outside of the zone are not that safe and I would be far from the French quarters. There would be no way I would pay the quoted rate. I go back outside to search for cheaper motels on my cellphone and while standing next to the bike she comes out and tells me she spoke with the manager and they would honor the price I had been given. Now I'm smiling again and follow her back inside. Tina, the manager, comes out of her office and apologizes for the misunderstanding, explains she would honor the price and since they don't have a lot of parking spots she would rearrange the cars so I could leave my bike in a safe and protected way. I unload the bike and a few minutes later I'm ready to head to Bourbon Street. 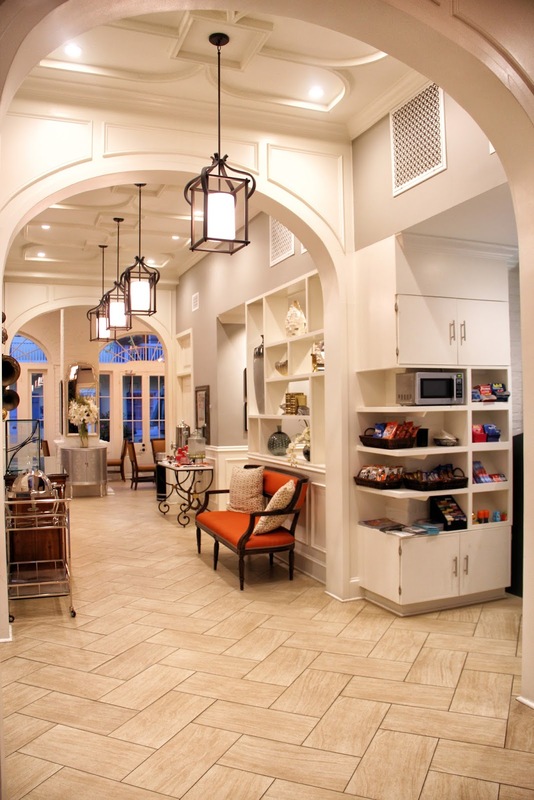 The hotel was built out of a few houses and the rooms are spread out through various properties. 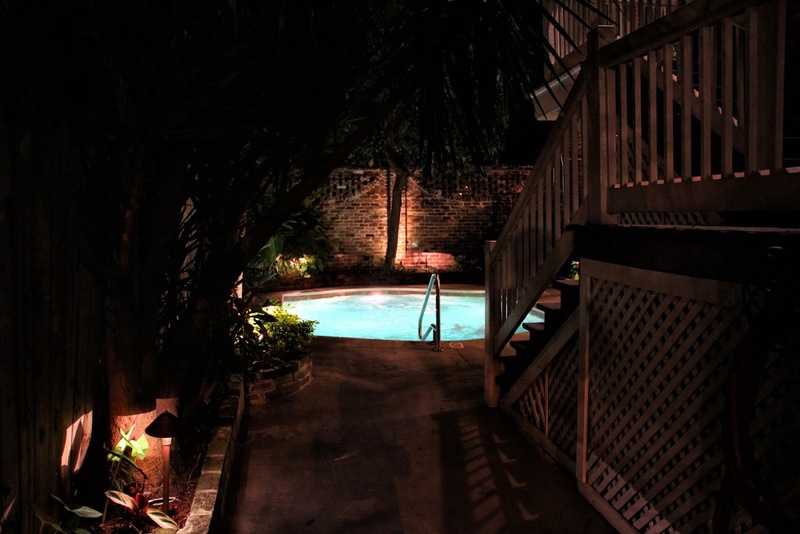 This alley leads to the back where one of the pools is located, yes, there is more than one pool. My room is across the street from the lobby. 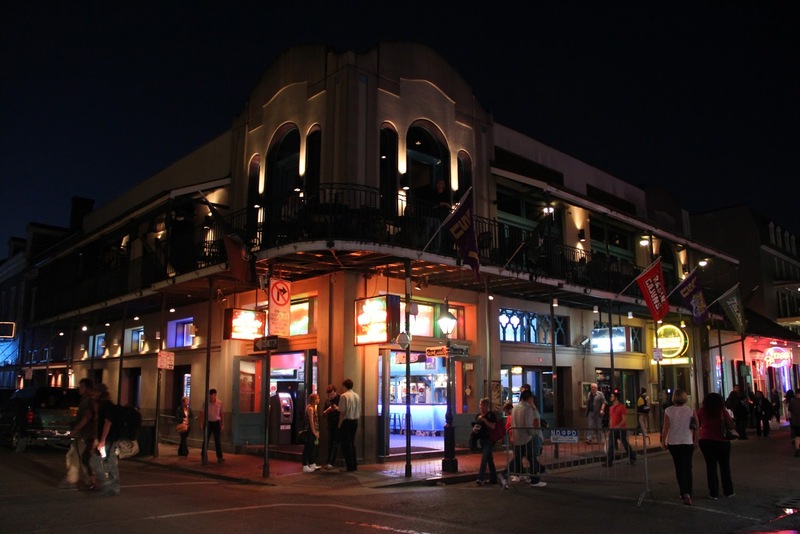 The hotel is only a few blocks from Bourbon street and soon I'm walking down the street where all the action happens during Mardi Gras. It's not as busy but there are quite a lot of tourists mixed in with the locals getting ready to hit the restaurants and bars. I will let the photos do the talking. 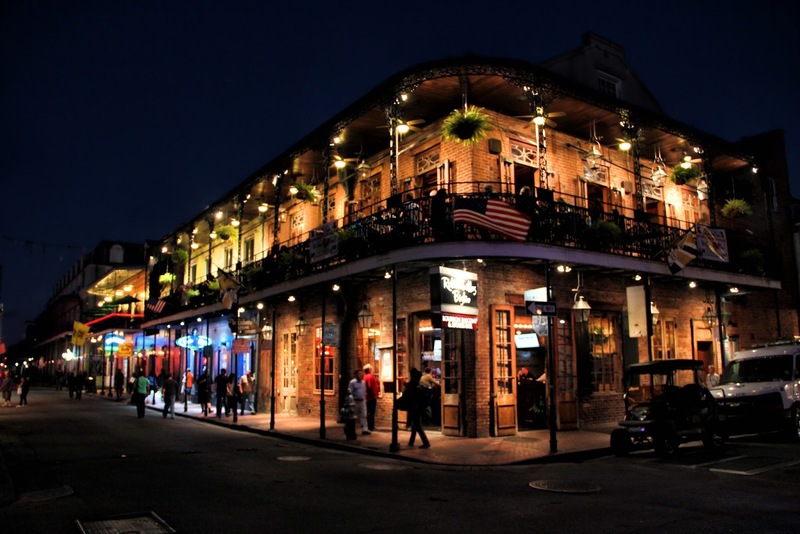 New Orleans has the fun side with nice restaurants and bars and then there's the seedy side of the French Quarters. 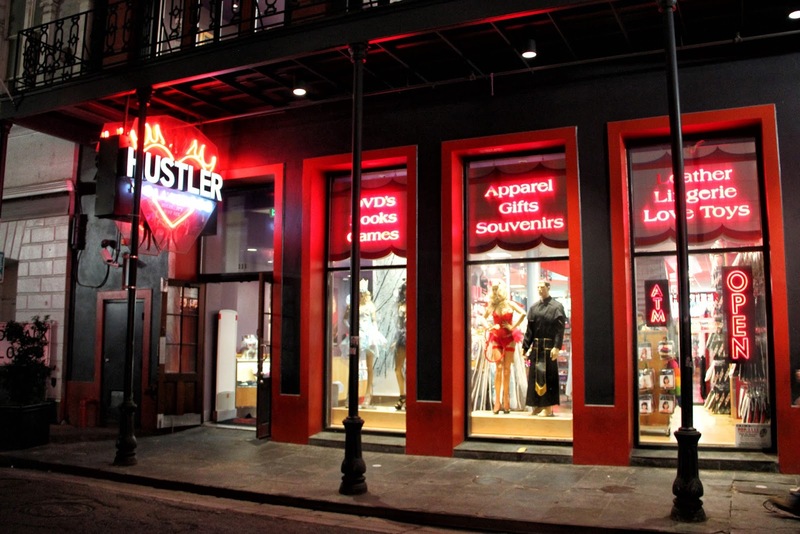 There are a few gentlemen's clubs and stores like Hustler on Bourbon Street. 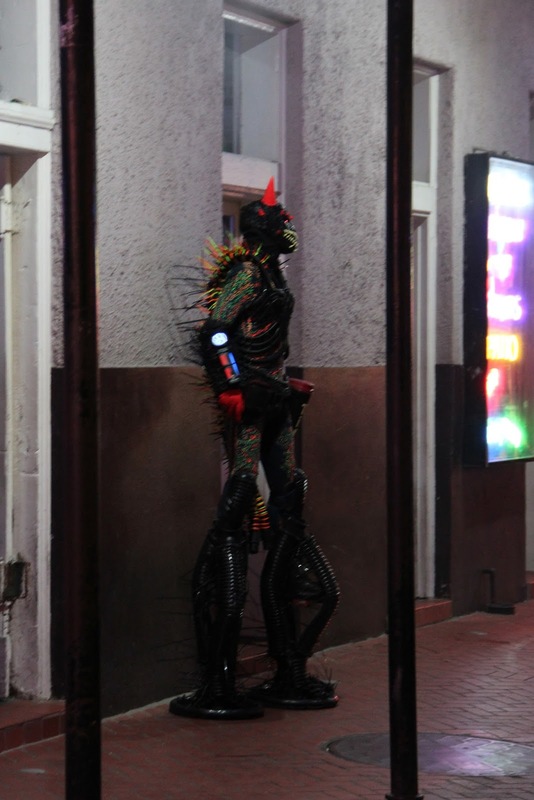 One guy was walking around scaring tourists dressed as an alien. He was getting tips from visitors for taking photos with them. It was getting late and I hadn't had dinner, I look around and see the "Pier 424 Seafood Market & Restaurant" with tables on the upstairs balcony. I head to the bar, grab a beer and ask a waiter for a table upstairs, unfortunately I have to wait about 30 minutes for a table. I sit at the bar and chat with the bartender and a guy from France visiting New Orleans by himself. The waiter walks by, sees me holding the fork and knife and says to me: "you know you eat that with a spoon, right?" of course I didn't know but I pretended I did. 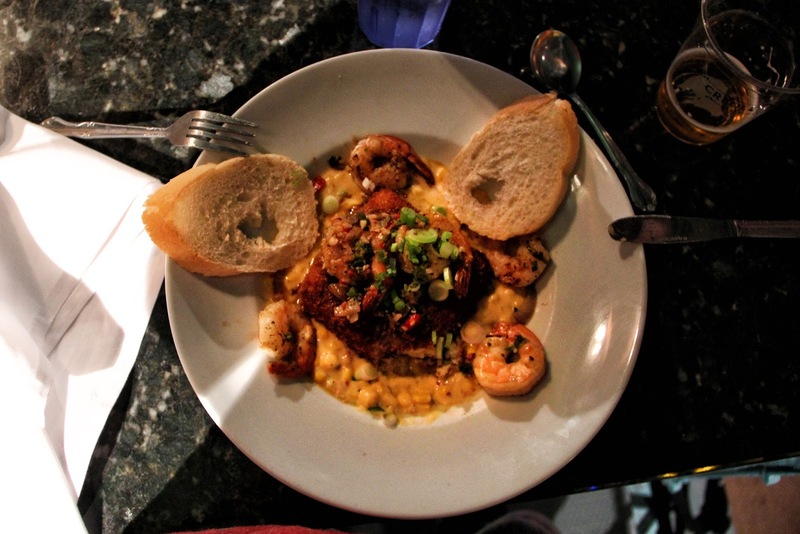 The food was very tasty, the shrimp were just perfect and the corn maque choux and tasso jus is amazingly delicious. 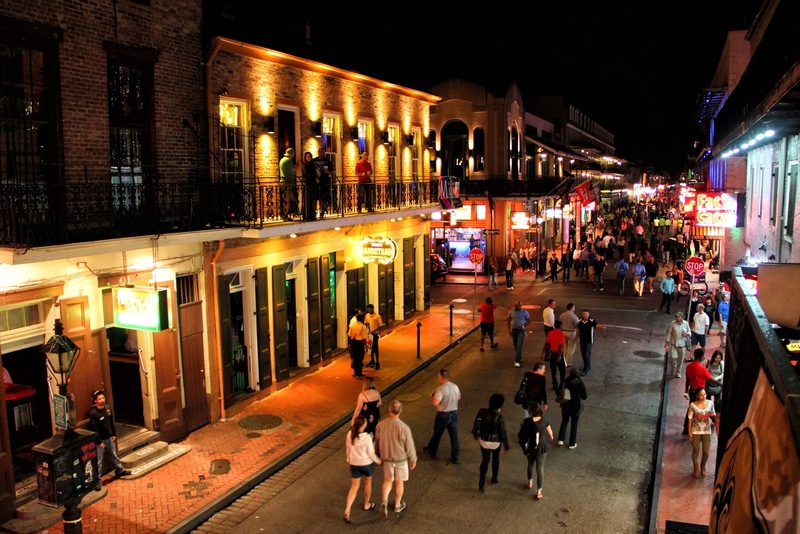 I had the perfect view of Bourbon street from my table. 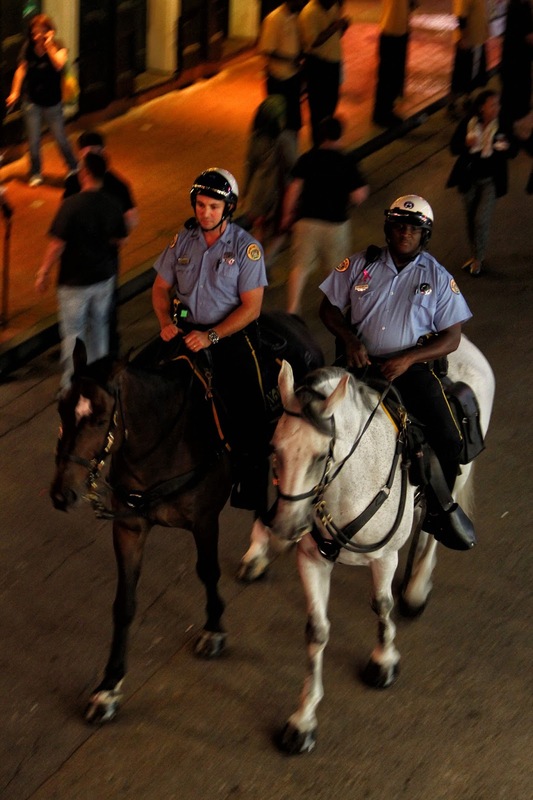 There were cops walking down the street, a few on horseback and ladies with less than stellar fashion. 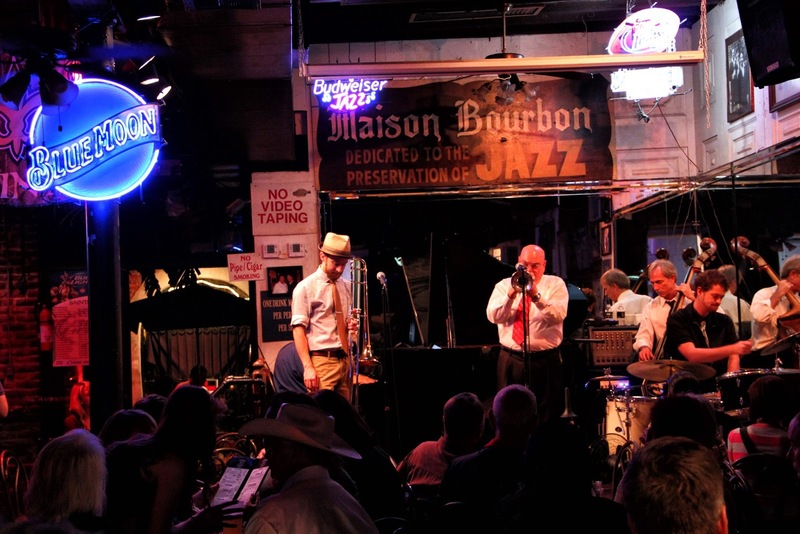 Later, I hang around a bar where loud southern New Orleans jazz is spilling onto the street. The guys were good and the music very lively and entertaining, the house was packed. It was around midnight when I head back to the hotel St. Pierre. It was the perfect time to walk around the hotel taking photos, either the guests were still having fun or sleeping. 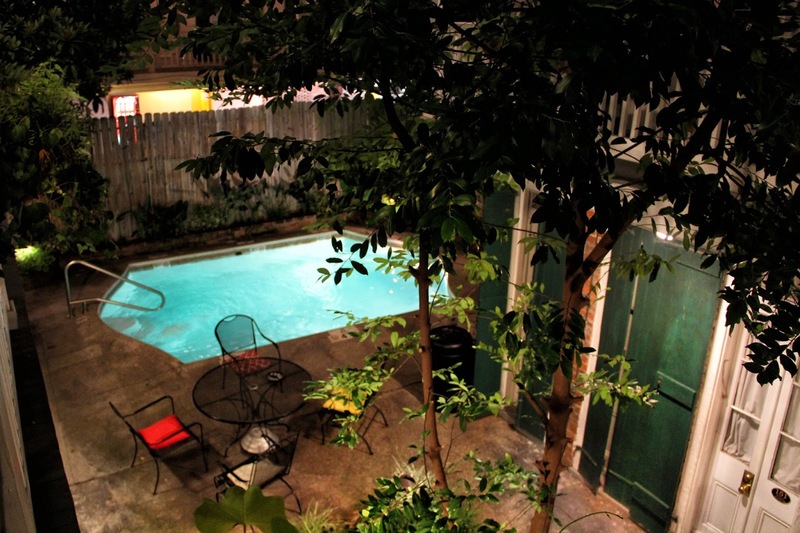 This pool is located behind the lobby in a little courtyard surrounded by a few of the rooms. Walking down the alley seen on the photo I posted earlier leads you to the second pool and another courtyard with more rooms, I was amazed at how they had turned a few homes into such a cute hotel. 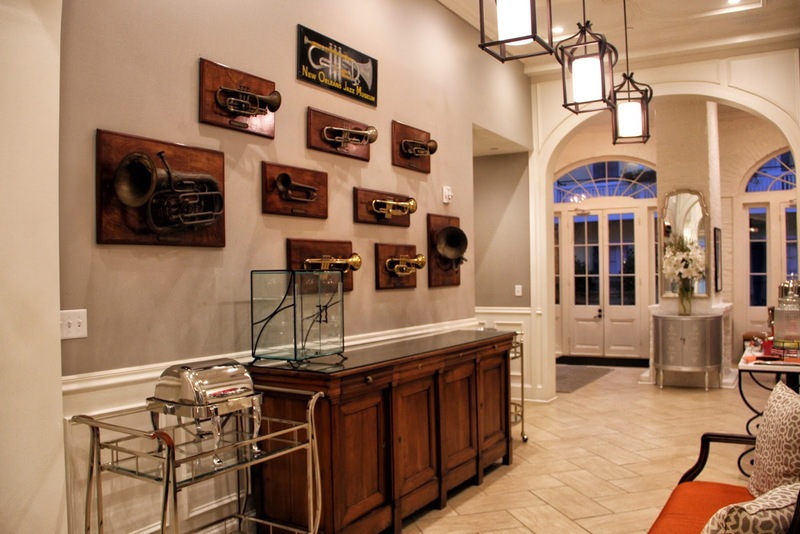 I highly recommend the St. Pierre hotel for anyone heading to the French Quarters, let them know you heard about them on "Riding The USA" blog, they will treat you very well. The view from the upstairs balcony. 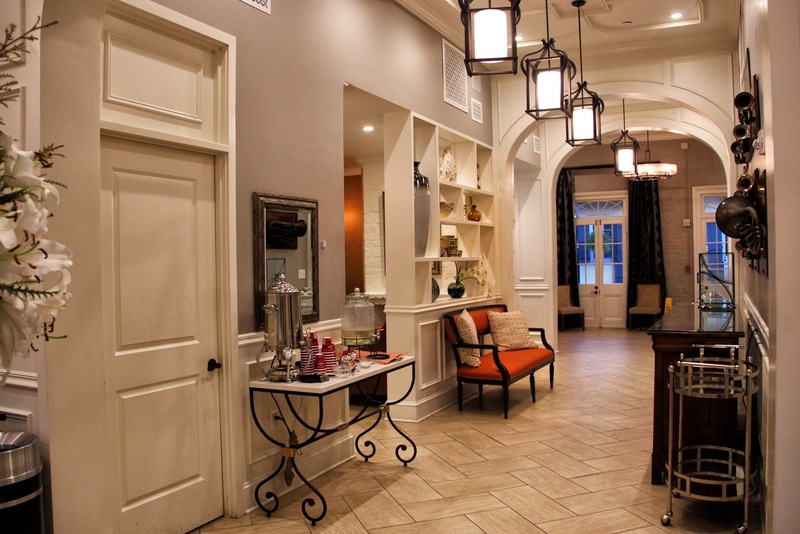 The balconies and the outside of the hotel look and feel really old but the inside rooms are first class. 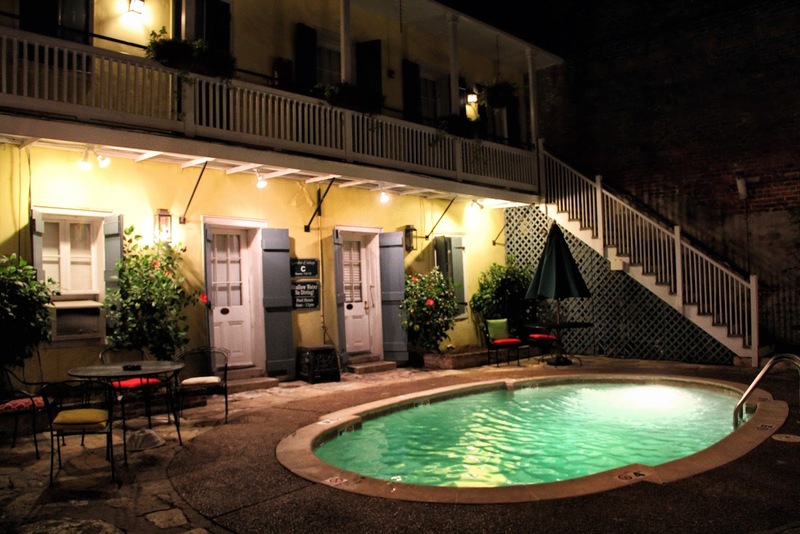 The Hotel St. Pierre is a collection of 18th century Creole Cottages, many dating from the early 1780s. 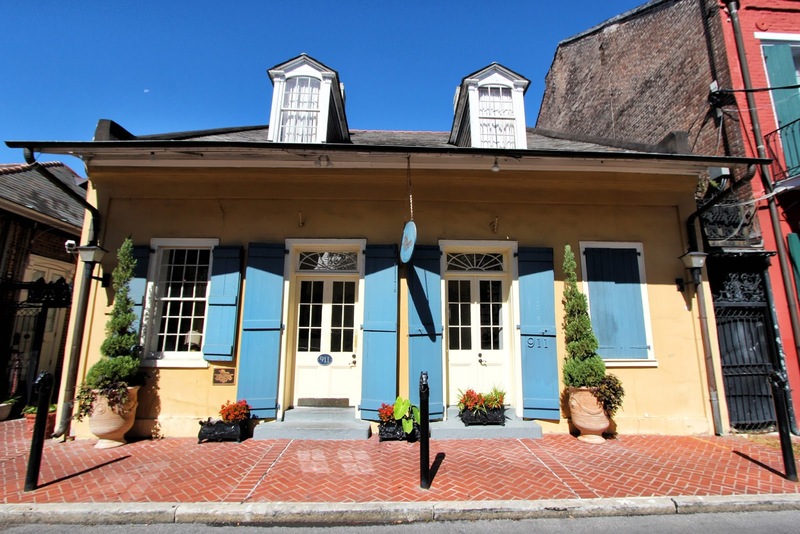 The hotel property includes the Gabriel Peyroux House which was erected in 1780 for Gabriel Peyroux de la Roche, a native of France. I have lots more photos but I will leave it for another post. 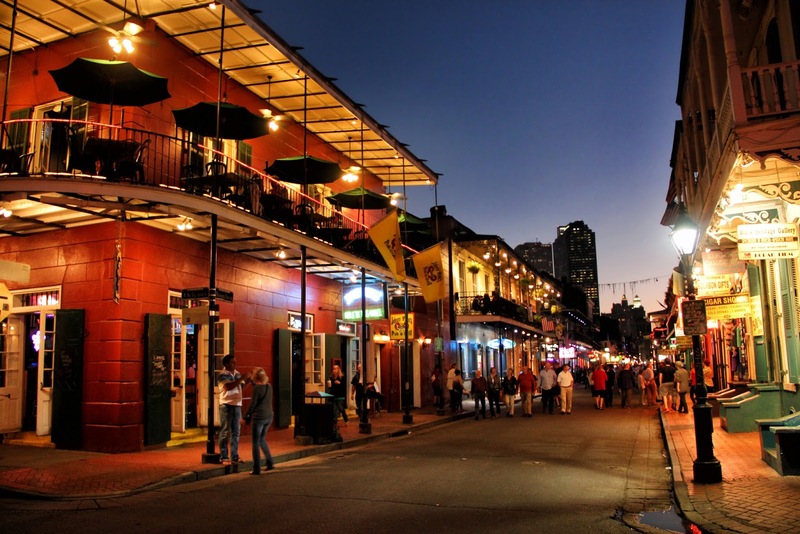 Tomorrow I will visit a few places during the day and then spend another night in New Orleans. 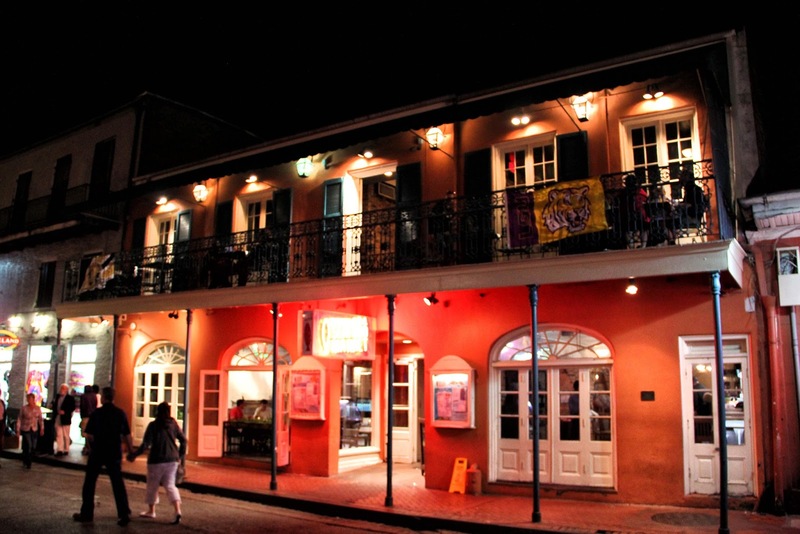 It's been many years since I was in New Orleans. Thanks for sharing a good find, George. Barbara, you need to visit it again, good food in the south. Thanks for reading. Never been there, but I am enjoying your tour. It's an interesting place but there are many other cities in my opinion that are much nicer. 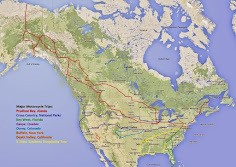 I have been all over the USA, it was just something I had to do to scratch off my bucket list. You should go though. Man, I am loving these photo's. I knew the city was beautiful and now I want to visit it more than ever. You will have fun Robert. Thanks for the comment. I enjoy sharing my photos. Beautiful photos! But I'll be the dissenting opinion as far as New Orleans is concerned. The buildings were nice and some were restored pretty well but both times when I was there (pre-Katrina) everywhere I went near the French Quarter smelled like a sewer.It made it very unpleasant to walk around. Even on the dike I would be overwhelmed by the smell. I'm sure there may be some really nice areas but I didn't fine any during my time there. Richard, you must have caught the wind from the wrong direction....I'm just kidding. I know what you mean, it's not very clean but that is normally the problem in the big cities, specially where there's a large concentration of restaurants and bars. I can take you to New York and show you beautiful places but can also take you to places where there's garbage bags pilling up on the street and the smell is not so good. I didn't notice any bad smells, nothing out of the ordinary. 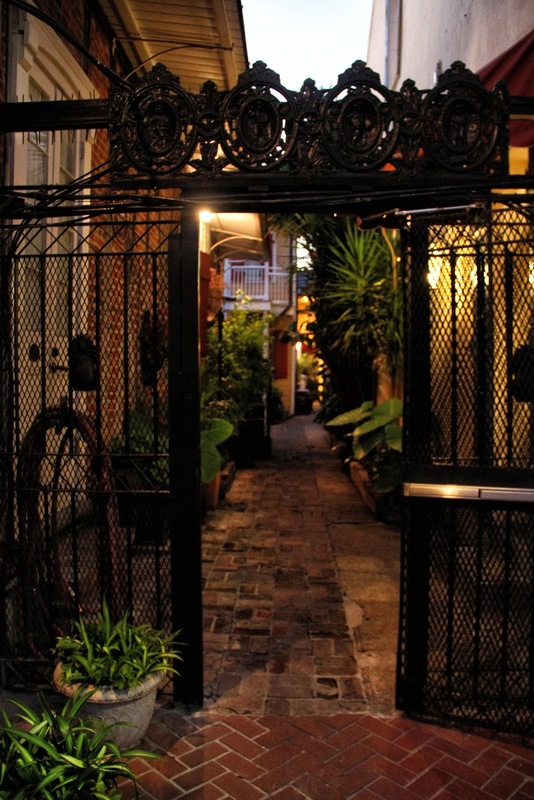 It is an old place (French Quarter) and the roads are narrow which makes it worse. I had fun but wouldn't like to live there.